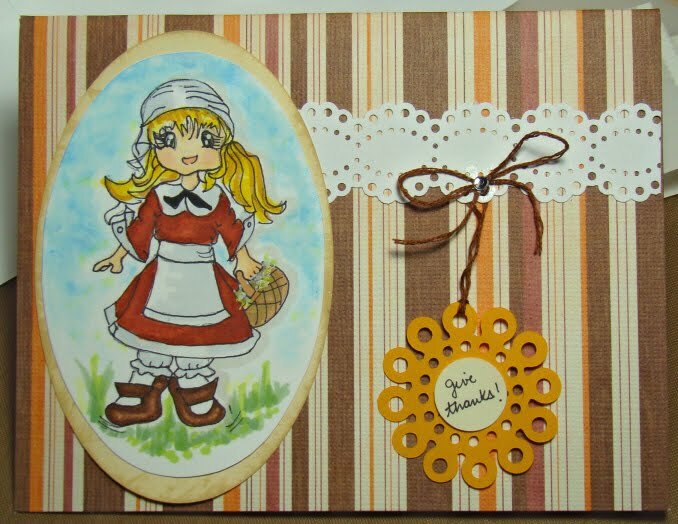 I have been following for a little while tons of cute and very instructive papercrafting blogs. I recently decided to grab some nice tools and try my hand on carmaking. I will be also posting about my impressions of a little slice of the cardmaking world. So much to learn! For now thanks for stopping by...and I hope to see you around! Leave a comment so I can visit you! Hey I am joining the Paper crafting world! Hey you all! For the ones that follor my other blog about sewing and my other experiments know that I was away for a little while. I moooved, so all my craft stuff was litterally stuffed in boxes! Yikes...being away from my pins and needles, embroidery, knitting and crochet tools was driving me crazy. Anywho...I have been unpacking, slowly but surely. In the mean time I started to folow some neat blogs about cardmaking...so you guessed. I hearby now declare myself a newbie cardmaker. Aham..and this is the place to see my newest meshuganeh! YAY! So come on over, talk, chat, comment, suggest, correct me. I am here to learn from you! Post a note so I can see your blog!